These LED bars of the METOLIGHT B-Bar series are designed as easy-to-install lighting bars for backlighting in advertising boxes, light boxes and much more, where a wide area is to be illuminated evenly. The B-bars are built on an aluminum core printed circuit board with only 20 mm width and only 8 mm height (including LED lenses) and have a 24 V DC terminal on both sides. The individual modules (available in 250 mm and 500 mm overall length) can be aligned seamlessly up to a length of 10 meters. Each bar is equipped with its own constant current driver. Thus even with long luminous strings, the brightness remains the same over all individual bars. The LED bars are equipped with high-efficiency SMD with an efficiency of 100 lm/W at CRI Ra> 90, each LED has a single lens, which attenuates the light forward and distributes to the side, so that at an angle of 160 ° one broadly same brightness. A LED strip with a length of 250 mm and an output of more than 600 lm almost matches the brightness of a 60 watt incandescent lamp. 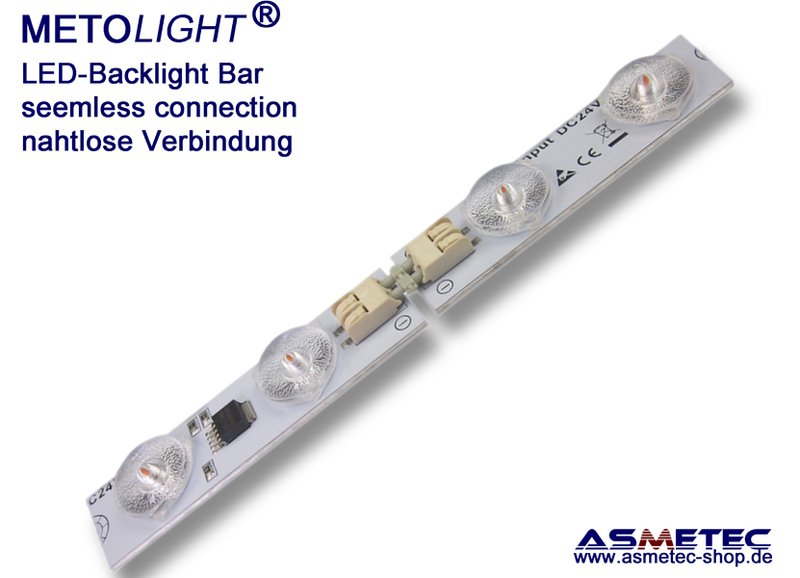 The LED bars can also be dimmed special LED dimmers. Through mounting holes, the LED bars are mounted by screws on a thermally conductive substrate (for example, a metal plate). Optionally, the strips can also be fixed with our special double-sided, heat-conducting adhesive tape. Backlight - backlighting in advertising boxes, light boxes, billboards, etc.